Ellis’ maternal grandparents owned a refined jewelry store on Broadway in Camden, NJ. Greenetz & Greenetz Jewelers had first opened their doors in 1921 and enjoyed over forty years of popularity. Most famous for their perfect “Blue White Diamonds”, Greenetz & Greenetz were also known for their affordable layaways. Prior to the inception of credit cards, Greenetz & Greenetz had been offering interest-free layaways and advertised “no budget charges”. 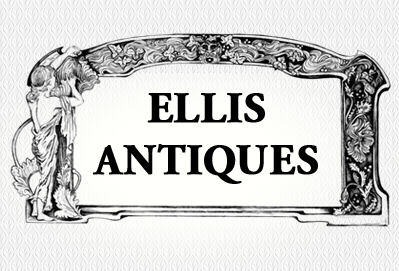 The family’s legacy of fine quality in conjunction with excellent customer service continues with Ellis Antiques. Ellis’ parents began to dabble in antiques in the bull market of the mid-1960’s, initially with flea markets, indoor shows, and finally running the full antique show circuit. This new venture piqued the young man’s interest and he began buying and selling as early as adolescence. He built upon the family business – expanding into auctions, a brick and mortar store, and estate sales. In addition to pioneering new ground for the family in such a difficult field, Ellis was active in the Philadelphia music scene in perhaps the greatest era of rock. On-stage, he garnered a following as an accomplished blues rock guitarist. Off-stage, he fused his passion for music and his business sensibility through independent concert promotions. In 1987 he married Francesca, who began assisting him, but by 1992 was collaborating full time. Her MBA in marketing and extensive research of antiques complemented Ellis’ “hands-on” expertise, enabling them to open their first retail shop in Collingswood, NJ in 1992. Francesca had been collecting antiques since age 12 and continued through adulthood – taking courses on antiques at Boston University. Her involvement in the business has been a constant inspiration, providing her the opportunity to buy, handle, and collect antique jewelry. She began making jewelry at 16 and continues to design today. You may have seen her wearing a handmade reproduction of a famous art nouveau piece by Renee Lalique. Her love of jewelry is clearly reflected in her on line shop and Bricks and Mortar shop. From the runways to classical designs, Victorian to retro 1960’s and Mid Century, Francesca’s offerings are second to none. Her keen understanding of fashion trends enables her to tailor the inventory of her shop according to market demands. Ellis is a true musician at heart. In addition to his love of antique and period furniture, and other antiquities, he is passionate about antique and vintage musical instruments. He currently has a very impressive collection of antique and vintage guitars, banjos and other instruments. Inventory changes regularly as Ellis is constantly adding his latest acquisitions to their stock. All pieces are professionally restored and refurbished, as close as possible, to their original condition. Come and see our new’ Guitar Room!’ in our Brick and Mortar store! It features electronics, amps and components as well. Ellis and Francesca are able to join forces to bring you over 95 years of combined experience in the fields of American, Continental, and French Antiques from the 17th through the 20th centuries, as well as Mid Century Modern, which is the current rage. Attorneys, insurance adjusters, and estate executors alike entrust their ability to provide both verbal and written appraisals. Their advantage lies in the knowledge of an ever-volatile market, reasonable rates, and availability. Since April 2016, Ellis Antiques moved from 812 to 810 Haddon Ave. The new location gives the shop much needed room and warehouse space for our on- line business.Ellis and Francesca are also involved in the real estate business. Buying, selling and restoring flip houses and apartment buildings. Whether you choose to buy an antique in our boutique or online, want to sell an unwanted item or entire house’s contents, selling a house in need of restoration or are just curious as to what something is worth, Ellis Antiques is the answer.